Sea Pines Bay Forest Condos: This hidden gem WEST of 41 is nestled in gated Bay Forest where the tree-lined, cul-de-sac street leads to a manicured courtyard entry. Updated home offers 2BR plus den/office, 2BA, 2 car garage, brick paved entry, courtyard & patio surrounded by lush tropical landscaping. Porcelain tile floors, soaring cathedral ceilings, renovated kitchen with new cabinetry, stainless appliances, granite countertops, updated bathrooms featuring glassed enclosed showers and a skylight for natural light, ADT Security System, newer Rheem A/C & hot water tank. The posh master suite is a retreat with a huge sitting area perfect for relaxing. Quarterly dues pay for just about everything making this a worry free full or part-time residence. 2.5 miles of shaded paved trails meander through the community around 3 lakes leading to the scenic boardwalk out to the pier and chickee hut at Hickory Bay. There you can fish, kayak, canoe & enjoy the amazing sunsets over the bay! Amenities include a pool, PICKLE BALL, tennis, bocce, clubhouse, fitness center, kayak storage and launch, and social activities. Perfect location-close to 2 beaches, 20 minutes to the airport and a short drive to dining and shopping. Naples Walk Bay Forest Condos: SPECTACULAR PRESERVE, GULF AND SUNSET VIEWS FROM THIS COMPLETELY RENOVATED 6TH FLOOR CORNER UNIT WITH NEARLY 1600 SQ.' OF LIVING SPACE. *Private garage available for $30,000*. Homeowner has paid meticulous attention to detail when renovating this home. Ultra-modern design kitchen has the finest granite counter tops, large center island, beautiful tile back splash, top of the line Samsung stainless steel appliances, dual-temp wine cooler, soft-close cabinets, deep stainless sink, tray ceiling and crown molding. The open concept floor plan allows modern living in pure luxury. Three perfectly separated bedrooms create privacy for everyone. Previous owner enclosed the covered lanai creating an addition to the under air living area. On cool nights you can still open the sliding glass doors to let in breezes from the Gulf of Mexico. Master bedroom has amazing western views. The master bath has been completely renovated to include a large walk in glass shower and walk in closet. Enjoy walking & biking the boardwalk trails with two lakes. Community has tennis courts, bocce, shuffle board and swimming pools. Located west of US 41, minutes to the best white sand beaches, shopping and dining. Naples Walk Bay Forest Condos: Penthouse, 1951 sq. ft under air, 199 sg ft lanai, 2150 total sq ft, storage closet on same floor, quartz kitchen and bathroom counter tops, custom kitchen with ample cabinetry, Master bath with jetted tub and stand up shower, new water heater, AC 2005, guest bath has shower/ tub combo, carpet, tile and tiled lanai with expansive Gulf of Mexico views!! This is offered turnkey furnished with King bed in master, Queen bed in guest room and 2 twin beds in 3rd guest room. Single car garage and carport can be purchased with this unit!!! Leased for a small yearly payment to Naples Walk of Bay Forest. Garage spot #21 and carport #37. Recent closed sale of $450k with no upgrades, garage or carport!! AMAZING UNIT, AMAZING VALUE. Storrington Place Bay Forest Condos: West of 41 and minutes to 2 award winning beaches, this attached villa in the gated community of Bay Forest offers soaring volume ceilings throughout the home. The Master suite includes new wood flooring, an oversized tiled shower, dual sinks and a fabulous walk in closet. The eat in kitchen with granite and white cabinetry includes a skylight for natural light and sliders with access to the lanai. An expansive lanai, paved driveway and entryway and an oversized 2 car garage complete this wonderful home. The air conditioner is only 3 years old. Bay Forest offers 2.5 miles of shaded paved walking trails that wind around three lakes and lead to the boardwalk out to the chickee hut and Hickory Bay to enjoy the wonderful sunsets. Television cabinet in den does not convey. Naples Cove Bay Forest Condos: Updated end unit with brand new AC! This condo offers 3 spacious bedrooms, two baths and a peaceful lanai area overlooking a lush preserve. The baths and kitchen have been updated with granite and wood cabinets. The kitchen also offers stainless appliances and a counter height bar, for a modern look. All turnkey furnishings are included. Move right in and enjoy! Bermuda Bay Bay Forest Condos: JUST REDUCED THIS RARELY AVAILABLE 1ST FLOOR END UNIT WITH LANAI, PRIVATE COURTYARD & GARAGE CLOSE TO BEACH! This desired Martinique floor plan has 3 BR, 2 BA, 1 CAR GARAGE, private courtyard & spacious screened lanai with a peaceful view to start or end your day. This is an opportunity to live in Bermuda Bay & enjoy the Bay Forest lifestyle! Features include electric roll down & accordion storm shutters, newer SS appliances, granite countertops, tiled backsplash, tiled main living & dining areas & plantation shutters! Bay Forest residents enjoy a beautiful tropical setting, amenities, activities, a boardwalk, estuary/back bay with direct access to the Gulf & is located in Naples, WEST OF 41 & CLOSE TO THE BEACHES! The clubhouse has a fitness center & library & the community is close to the beaches via Vanderbilt Drive! Bay Forest has over 2 miles of walking, jogging & biking paths, 4 Har-Tru tennis courts, 4 bocce ball courts, shuffleboard & a half-mile boardwalk to the peaceful chickee hut overlooking the back bay to enjoy kayaking, fishing & sunsets. Convenient to shopping, dining, entertainment, medical, places of worship & schools, there is something for everyone! Naples Cove Bay Forest Condos: Bay Forest is a beautiful gated community with wonderful lush foliage. It has the feel of a preserve/sanctuary. This unit has been completely remodeled & updated. New kitchen & flooring, new hot water heater. The community has a clubhouse, library, tennis, pickle ball and bocce courts. exercise facilities overlooking the lake, 2-3 miles of walking/jogging, biking trails, a boardwalk to the back bay for fishing, canoeing & kayaking with storage rack availability. Purchase includes 1 car garage. Unit sold completely furnished. Naples Cove Bay Forest Condos: *END OF SEASON SPECIAL* LOCATION-LOW FEES-LOW TAXES -TOTALLY REMODELED-FURNISHED-PRICED TO SELL QUICK. Stunning condo in breathtaking Bay Forest ... beautifully updated with high end materials. Updates include engineered bamboo wood floors, solid wood cabinets, quartz counters, stainless appliances, tiled baths, California style closets, plantation shutters, and more, no expense spared. Bay Forest is one of the most beautiful communities in North Naples and is West of U.S. 41 on the West side of Vanderbilt Drive. Nature lovers can walk or bike the over 2 miles of paths around the stocked fishing lakes and through the Mangroves. 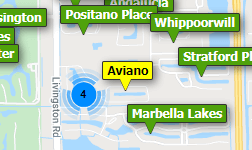 Vanderbilt bike trail is just outside this community and connects to Naples and Bonita's best beaches. A boardwalk leads to the back bay gazebo with canoe/kayak access and storage. The main clubhouse has a fitness center, Har Tru tennis courts, bocce ball, pickle ball, library and gathering room with deck. Naples Cove is within Bay Forest and has a pool with BBQ deck with many social activities. It is close to beaches, shopping, dining, entertainment and recreation! Location- Low taxes-Low Fees- Everything you're looking for. Click link for 3D tour. Bermuda Bay Bay Forest Condos: JUST REDUCED! BRING ALL OFFERS to purchase a TURNKEY FURNISHED, RARELY AVAILABLE TOP FLOOR END UNIT with SOARING VAULTED CEILINGS! This Bimini floor plan in Bermuda Bay I is very quiet, light, bright & airy with three walls of windows. The main living & dining areas are all tiled and open into the tranquil screened lanai. The generous master suite has an en suite bathroom & a large closet & also opens into the lanai. The guest suite features a comfortable sized bedroom, bathroom with linen closet & large hallway storage closet. The cheery kitchen is well equipped & has a table & chairs, large pantry, plenty of storage, vaulted ceilings & plant shelves. A full sized side-by-side washer & dryer is in the unit & a dedicated, covered carport is just outside. Both stairs & a common elevator lead to the unit. Bay Forest amenities include lush landscaping, walking trails, a boardwalk with a tiki hut that extends over the backwater of the Gulf of Mexico with access for paddle boards/kayaks, bocce ball, tennis, pickleball, shuffleboard, community pool, fitness center, community center, library & numerous social events. WEST OF 41 & MINUTES TO THE BEACH! Naples Cove Bay Forest Condos: C.15636 - A hidden paradise within Bay Forest. Nature lovers, tennis and fitness enthusiasts will enjoy the walk/biking trails, stocked fishing lakes, boardwalk that leads to the back bay. Canoe/kayak storage, a Clubhouse with fitness center, Har Tru tennis courts, bocce ball, pickle ball, library and deck forgathering. Naples Cove is equipped with community pool/spa with barbecue area. This is a great value to be so close proximity to beaches, shopping, and dining with low fees. Being sold turnkey furnished. Naples Cove Bay Forest Condos: Nestled within the gates of Bay Forest, you'll relish the peacefulness of your undisturbed view of the nature preserve from the lanai of this furnished condominium. As the natural light filters in, this very inviting unit offers a comfortable retreat from the day’s activities. Over 2 miles of walking/bicycling paths meander by the preserve and beautifully landscaped lakes. With Har-Tru tennis courts, Bocce ball and pickleball courts, shuffleboard, and a fitness center, there's plenty to keep you active. Canoeing, kayaking and fishing can be enjoyed in the Back Bay. The pool is just steps away, and beaches are only minutes from Bay Forest. There's even a boardwalk crossing the Bay to a relaxing chickee hut, where you can enjoy beautiful sunsets. Come see all that is offered in this hidden treasure located west of 41 and Vanderbilt Drive! Bermuda Bay Bay Forest Condos: Come see this rarely available first floor condo unit in the highly coveted community of Bay Forest. 2 Bed / 2 Bath condo features a spacious open floor plan plus a den at over 1,400 sqft. The Bermuda Bay II building backs up to a protected nature preserve which allows lots of privacy. Home is being sold Furnished. Condo also includes a detached one car garage. The Bay Forest community is rich with many amenities including: a Library, Clubhouse for Resident Functions, Workout Room, Tennis Courts, Bocce Courts, Shuffleboard, Pickleball, a Long Boardwalk to a Tiki-Hut overlooking the Bay where residents can go Kayaking, Swimming and Fishing. Also over 2 miles of walking and biking paths. Condo is only minutes from public beaches, restaurants, shopping, and more. Need professional assistance selling your property at Bay Forest Naples? Find out how an Area Specialist can help to generate more property exposure in order to get the most money for your investment in the least amount of time.